Music: Under Employed PSYOP Weapon? We all know that music can influence our moods. We react differently to Willie Nelson than to Beethoven. On October 23, 2015 the New York Times ran article that started on Page 1: “Palestinians Set Their Rage to Violent Beat”. The article ran in a number of other places as well. (see: http://www.ndtv.com/world-news/palestinians-set-their-rage-to-violent-beat-1236004, which is also the photo source). 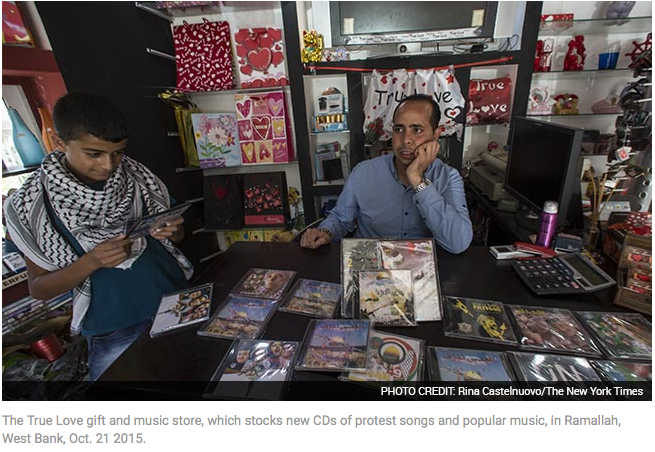 The article talks about Palestinian protest music. Music has been a part of the Middle East throughout its history. Today’s Palestinian teenagers are spending their shekels to get the 21st century version with such catch lyrics as “Stab, stab”. In some places, perhaps Africa, music might be an important element of any influence campaign. In others, the situation becomes more problematic. For example while Afghanistan has had a long history of music, the Taliban and others have suppressed music. In any event, it’s always important to consider any form of influence that combines senses, especially media that invoke emotion as music clearly does. Combatting Radicalization Through Government Influence: Good, Bad or Ugly? While this proposed program is only in it’s formative stages, the article has some key points that are worthy of consideration by the influence community writ large. 1. 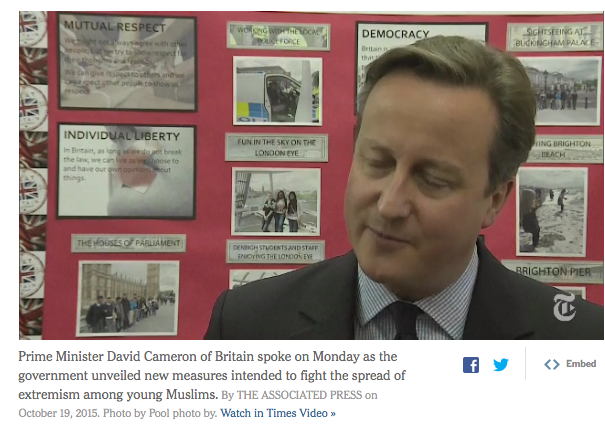 How aggressively can a government confront extremism without alienating their opposing moderates? 2. Will promoting a nation’s values (British, American, German, etc.) raise strong concerns of moderates in the target audience? 3. Is it really possible to ‘clamp down on the dissemination of extremist messages… by involving the “industry government and the public”’? The article itself is concerned with influence efforts inside Britain, yet the three points above are applicable to many current and potential influence battlefields. The notion of domestic influence is one that has not been widely considered. Recent incidents conducted by non-affiliated terrorists (e.g. Boston Bombing) or by domestic terrorists (Oklahoma City) confirm that the threat exists in the US as well as Britain. The implication is that anyone inside a country may be radicalized. Does the government have a duty to try and prevent the radicalization by employing its resources to disrupt the radicalizer and minimize the effectiveness of their messages and if so, how likely is it that they will succeed? Taking each point in turn. Any influence effort needs to strike a balance. This implies careful research and perhaps pre-testing, focus groups and enlisting moderates to help craft the campaign and its messages. Secondly, promoting one’s values to another is IMHO not a good strategy. Others outside your sphere really don’t want your values – they have grown up with theirs and only multi-generational evolutions can alter that path. Lastly, given the porous and borderless nature of social media, this would seem like the digital equivalent of cleaning out the Augean Stables. Even so, is it worth the attempt? On October 15, 2015 President Obama made an extensive statement explaining is ‘new and improved’ policy WRT to US troops in Afghanistan. (See: http://www.snappytv.com/tc/910095, which is also the photo source). The President noted that 9,800 troops would remain to train Afghan forces and to support the counter terrorism mission against Al Qaeda. While I don’t generally use the Blog to comment on matters outside the PSYOP/MISO community, however, as one of my SF colleagues used to say “Deja Doo Doo” which means I’ve seen this sh*t before. 1. Hello!!!! What about the Taliban that seem to have bided their time and are now making gains in Afghanistan, perhaps due to the vacuum created by the departure of US troops and the inability of the Afghan government to actually govern. 2. If we are to thwart the advance of the Taliban and really degrade Afghanistan as a resource for terrorists, it seems to me that this feeble approach is not going to yield positive results. 3. My take is that Afghanistan is, for the most part, a collection of microcosms. The foundation of the country is the family, the village, and the tribe in that order. 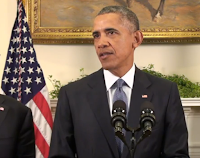 · If the overall IO mission in Afghanistan is defined as U.S. Military Information Operations in Afghanistan Afghan government and its foreign allies against the Taliban insurgency, this has not been achieved. · The biggest PSYOP successes have been in the area of face-to-face communication and the new emphasis on meetings with jirgas (local councils of elders), key-leader engagements, and establishing individual relationships with members of the Afghan media. Also, the concept of every infantryman being a PSYOP officer, as carried out by the 1st Battalion (Bn) 5th Marines and other units, is also very effective. In this respect, the success of civic action and development projects in promoting\ a positive image of the U.S. military and the Afghan government should be pointed out, although this varies greatly among localities. · On the negative side of the ledger, the most-notable shortcoming has been the inability to effectively counter the Taliban propaganda campaign against U.S. and NATO forces on the theme of civilian casualties, both domestically and internationally. While the President stated that he has talked extensively with his National Security Advisors, perhaps he should talk to others who see the Emperor’s New Clothes for what they really are – a piecemeal attempt to achieve an audacious goal. Are we ready for an anti-Daesh Influence Campaign Task Force? The UK based Quilliam organization (www. Quilliamfoundation.org) recently published an exhaustive report entitled: “Documenting the Virtual ‘Caliphate’” which can be downloaded from their website. The 50 page + report provides a month long snapshot of Daesh propaganda between 17 July and 15 August 2005. Which consists of 1,146 “separate propaganda events”. It is generally believed that Daesh is winning the propaganda and influence war. This report was developed because Quilliam believed before there is any hope of countering this influence onslaught, much less overcoming it, it is critical to understand the deeper nature of their propaganda efforts. 2. While consistent overall, the Daesh brand shifts according to events. 3. Over half of the effort is aimed a depicting the utopia existence under the ‘caliphate’. 5. The military is generally shown during offensives or in stasis. 6. Military attacks with mortars and rockets are shown even though they are not part of any actual offensives. Rather the intent is to show a perpetual offensive. 7. Control of the population in their current AO – discouraging rebellion and dissent seems to be a major theme. 9. The global desire to find a panacea counter-narrative to undermine the Islamic State brand is misplaced. Categorically, there is no such thing. Those engaged in the information war on the ‘caliphate’ must take a leaf out of the group’s own media strategy book and prioritise quantity, quality, variation, adaptability and differentiation. Most importantly, though, it must be based upon an alternative, not counter, narrative. It seems to me that a multinational effort is required that can cut across national boundaries, employs commercial, military and diplomatic expertise. This task force should be part of an international organization, which, along with its members could provide personnel and funding for the long haul that will be required to deal with this challenge. It appears to me that a NATO lead makes the most sense mainly because it is an existing multi-national organization that has appropriate membership and expertise. Set along the lines of a Combined Joint Influence Task Force, this new organization would of necessity focus on cyber media, but would also be able to employ more traditional media such as television, radio and print whenever it made sense to do so. Diplomatic (Public Diplomacy) participation at the highest level and liaison across embassies in the region and elsewhere would be another key element needed for successful execution. This is a ‘stalking horse’ in the sense that my purpose is to stimulate input from Blog readers. Comments eagerly awaited.